When my son, Matt, was younger, my husband and I seemed to have the same conversation every year: “How much of the pumpkin carving can Matt safely do?” A child’s manual dexterity improves with each passing Halloween—but that doesn’t always seem to come with an increase in common sense, as any ER doc will confirm. What are the best ways to include younger children in the pumpkin-carving festivities while keeping everyone safe? I checked with the folks who know a lot about these matters: The American Academy of Pediatrics, the American Society for Surgery of the Hand, the Department of Orthopedic Surgery at New York State University, and the American Society of Hand Therapists. These folks have seen it all, and they have some great tips to help keep your little ones safe around the pumpkin-carving table. They might just keep Mom and Dad from needing a stitch or two, as well. Carve your pumpkin in a clean, dry, well-lit area. Wash and thoroughly dry all of the tools that you will use to carve the pumpkin: carving tools, knife, cutting surface and your hands. Any moisture on your tools, hands or table can cause slipping that can lead to injuries. Very young children should never carve pumpkins—but they can still help. Leave the sharp stuff to older children or parents. 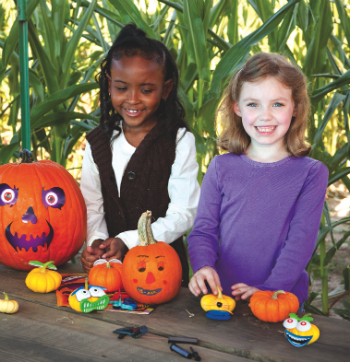 Little ones can draw on pumpkins with markers. Some families carve a big pumpkin and have younger children create their own designs on mini pumpkins. Children can also help clean out the “goop” and seeds from inside the pumpkin. Messy fun! Always have adult supervision during carving—even with teens. Doctors often report seeing adolescent patients with injuries from pumpkin carving. Adults feel that the children are responsible enough to be left on their own, but accidents happen (and teen judgment isn’t always that of adults—no Halloween surprise there). Remember, it only takes a second for an injury to occur. Teach knife safety to older children. Teach the following safety rules: Always point knives away from you. Keep your free hand away from the direction of the knife. Use slicing motions and never force the knife. Consider buying pumpkin tools instead of using a knife. Special pumpkin-carving kits are available in stores and include small, serrated pumpkin saws that work better because they are less likely to get stuck in the thick pumpkin tissue. According to a study by the Department of Orthopedic Surgery at New York Upstate Medical University, people who used pumpkin-carving tools specifically designed for this purpose had fewer, less-severe injuries compared with people who carved pumpkins using knives. Small, votive candles (as opposed to tall, skinny candles) are safest for candlelit pumpkins. Candlelit pumpkins should be placed on a sturdy table, away from curtains and other flammable objects, and should never be left unattended. Even better: use battery-operated candles.